Miso is one of the country’s most famous traditional ingredients, and it has been in wide use since its invention in the 9th century. It is usually made from a mixture of soybeans and rice that is fermented and aged. However, in some regions, wheat is used instead of rice, or the miso is made using only soybeans. Also depending on the locale, there are different lengths of aging and different methods used to process miso. This variation in preparation means that miso’s flavor, scent, and color will also change considerably from place to place. 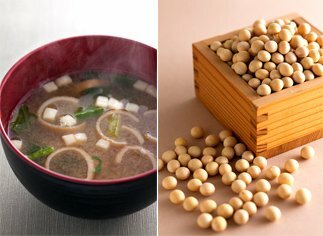 The types of miso used across Japan are innumerable. 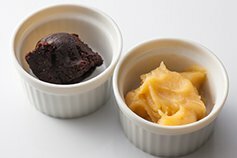 From the many varieties to choose from, Chef Stephane selected red miso and white miso to add as ingredients for baking. Harnessing their special characteristics, using the two different kinds of bread. “Because red miso is a little bit salty and has a striking scent, I think that it works well with a hard bread like pain de campagne or a baguette. 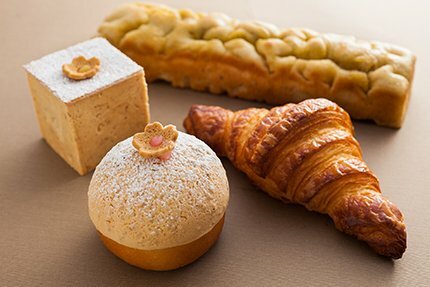 On the other hand, you can taste the sweetness of white miso, so a Viennoiserie like a croissant or brioche matches quite nicely with it.” Chef Stephane came up with the idea of mixing the white miso into some soy milk before adding it to the croissant dough, so that it would not dry out. 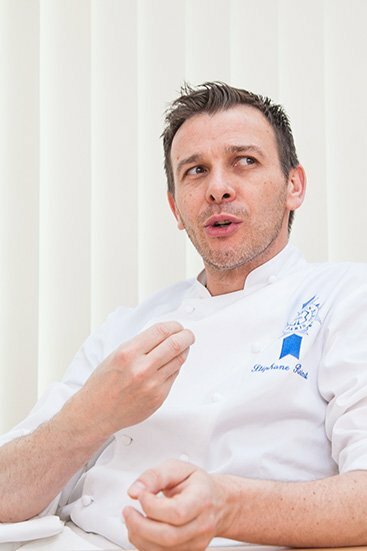 Chef Stephane said that he never encountered an ingredient that tasted like miso until he came to Japan. But thinking back on it, he noted that there are many fermented foods in French cuisine too, such as wine and other liquors, cheese, sauerkraut, and anchovies, just to name a few. And, of course, bread is a kind of fermented food as well. “As a bread craftsman, I am very well acquainted with fermented foods,” he continues. “Yesterday I made a vinaigrette dressing to which I added olive oil, lemon, soy sauce, and miso. I sprinkled that on some fresh vegetables, and it was delicious.” Miso is an ingredient that has stimulated Chef Stephane’s curiosity and is steadily giving him more and more ideas. “Because of the salt content of miso, it can be used in cooking with anchovies, or included in a tapenade. This time, through some experimentation, I used it with crème Chantilly, which was also delicious,” he says with a laugh. As Chef Stephane is discovering, the possibilities of miso just might be endless. White miso is shown on the right, and red miso is on the left. White miso is made by mixing simmered soy beans and steamed rice. Red miso is made only from steamed soy beans, which are then aged over a long period of time.